At the discretion of CAS we will include multiple photographs of your item on some certificates in order to add additional detail. 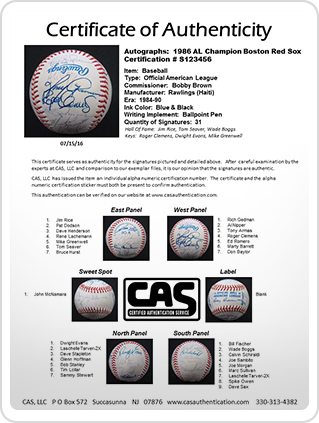 In the case of team signed baseballs CAS certificates will feature seven full color photographs highlighting each individual panel of the ball. A full color image of the item will be uploaded to our online verification system to further ensure the authenticity of your item. Items submitted for this process which fail authentication will receive an 8 ½" x 11" full page document including a full color photograph of the item and a detailed list of reasons for our decision. 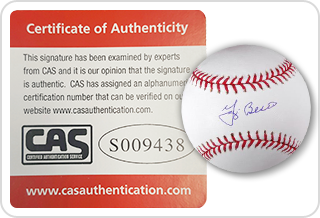 This service is used for most items valued under $300 and includes a 2 ½” x 2 ½” certification card with a matching tamper proof sticker on your item. Both the card and sticker feature a unique alphanumeric number that can be verified by clicking here. Discretionary values determined by CAS. A full color image of all fabric items will uploaded to our online verification system in order to ensure the authenticity of your item. (i.e Jerseys, Caps, Pin Flags etc) Items submitted for this process which fail authentication will receive a rejection card stating our decision. 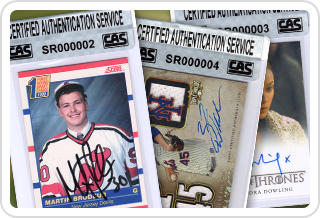 This service can be utilized for trading cards, cut signatures, index cards, post cards etc The item will be enclosed in a semi rigid holder and sealed with a tamper proof label. 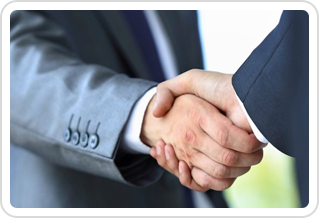 The label will feature a unique alphanumeric number that can be verified by clicking here. Occasionally the experts at CAS cannot render an opinion on a signature(s). If an item falls under this circumstance we will issue a credit voucher for the full value of your authentication fees to be used towards a future submission.